As you may know the Latin-american KDE meeting (LaKademy) is happening right now in São Paulo city, more precisely at Free Software Competence Center of IME-USP  and I here too. After a long time I am back to São Paulo city for more time than just taking connection flights hehe. Yesterday was the first LaKademy's day and we had some presentations for the general public. During this second day Sandro Andrade is presenting his Qt programming course. In the next two days we will have hacking sessions on KDE software and as Plasma Network Management maintainer I am interested in making networking easy for KDE users. Although I have not been pushing that much commits to network management repos  I used to do years ago I am still working on some improvements for the new Plasma NM, mostly non-visual changes though. Jan Grulich, Björn and Thomas Pfeiffer are doing a great job on Plasma NM's GUI so this task is in good hands. Passing more error information to the user so he/she can know if the problem is with his/her login, password, certificates, or with the local or the remote infra-structure, etc. With this information in hand the user can contact the correct person to solve connection issues, being the local network administrator or the network administrator of his/her university, who with Eduroam may not be the same person. The aim for task #2 is importing a xml file that contains all the information above, well, except the password, of course. There is already configuration importing support for OpenVPN and VPNC connections in Plasma NM, so this will be the third connection type that Plasma NM will suport that. 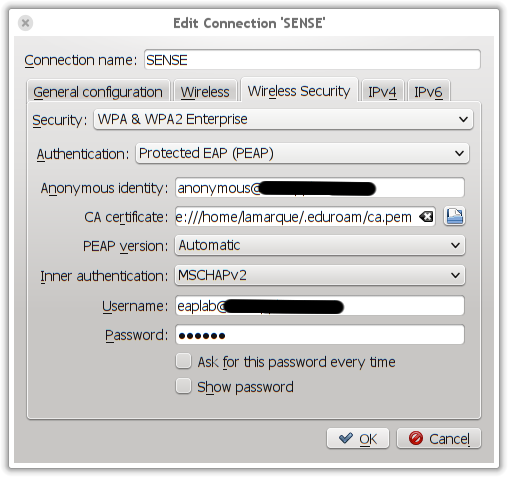 This implementation may be used for other WPA2 Enterprise connections as well. To implement task #1 I have been digging into wpa_supplicant and NetworkManager souce code in the last months (during my spare time). I already have a patch that gets the data from wpa_supplicant and now I am implementing code to set up the correct structures in NetworkManager. The code is generic and the result can be used by other NetworkManager clients as well, of course. When the patch is ready I am going to send it to NetworkManager's developers for reviewing. USP stands for University of São Paulo, the biggest and one of the most important Brazilian universities. there are networking code in plasma-nm, libmm-qt, libnm-qt, kdelibs, and kde-runtime repos and also in (the already deprecated) networkmanagement repo.